Metal Tiger Plc (LON:MTR) CEO Michael McNeilly talks to DirectorsTalk about the sale of its T3 interests to joint venture partner MOD Resources Limited. Michael provides shareholders with a lot of detail around the deal, explains its significance, lets us know what else is going on at the Kalahari copper belt and the next steps for the company. 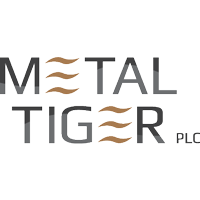 Metal Tiger plc is listed on the London Stock Exchange AIM Market with the trading code MTR and invests in high potential mineral projects with a precious and strategic metals focus.